Roger Smith is drilling the holes for the I strut on his Pitts aerobatic homebuilt airplane. A biplane has two wings and requires a strut to hold them together. Click Here's a part that scares me to death. Roger is drilling the holes for the " I " Struts. 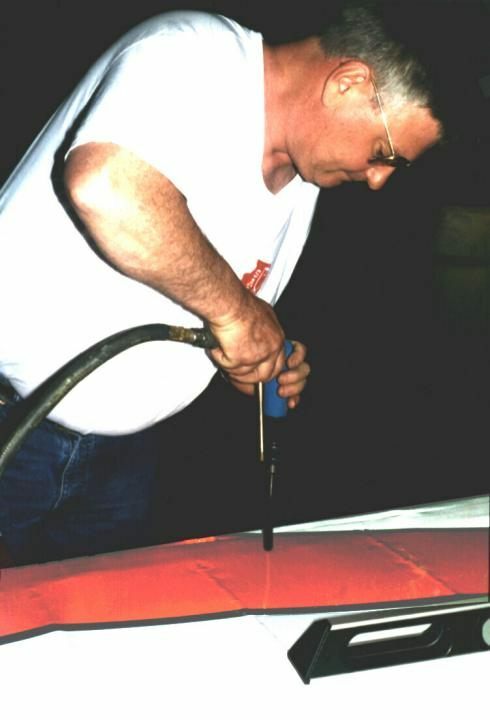 The holes were actually pre-drilled in the wing spars before the covering was put on the wings, but here he is punching the holes in the fabric and slightly enlarging the holes through the spars, (I Think) You must remember, I was just an observer and part time helper on this project. This step must be completed before the " I " Strut and the upper wing can be attached. The Pitts is a biplane and requires a strut to hold the top and bottom wings together.